I love when I read a book and find myself totally transported to another time and place. When the book is so good that I can't put it down and stay up later that I should simply so I can read a little more and try to 'help' the characters uncover the truth before they find themselves or their loved ones in danger. 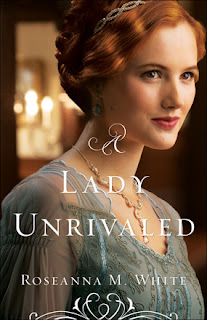 A Lady Unrivaled by Roseanna White was just that type of book. Her story was so engaging that I simply wanted to keep reading. As with the The Lost Heiress, this third book in the Ladies of the Manor series had the perfect balance of romance, adventure, mystery, intrigue, deception and faith. Even though this was the third book in the series, it very much so can be read on it's own. I have read the first book in the series and somehow missed reading the second, but would like to go back and read it (even out of sequence). Her character development and scene setting was terrific, so much so, that I was pulled into the story, I felt almost like I was living the story along with the characters. I loved seeing glimpses into the ongoing stories of the characters that we met in the earlier books and of course, further development of some of the characters that we simply met in the earlier stories. I loved Ella's determination and Cayton's softer, creative side. Seeing them each interact with Cayton's daughter was endearing. As each character grew during the story, they found pathways that were much different than they might have originally expected. As the story concluded, I found that I really enjoyed the way that the story concluded and the curse of the Fire Eyes resolved in a fantastic way, helping to ensure that others would not fall into the danger of the curse. If you are a fan of historical fiction, I would recommend checking out this book (and the rest of the series, for that matter).